DERRY GAA: Claudy’s ‘21-Year Goal’ condemns Glenullin to Division Two! The old adage of the show not being over until the ‘fat lady sings’ was never more appropriate than in this tense, exciting and thoroughly compelling game at Celtic Park. The prize for the winner was a place in the 2016 Derry senior league and championship. It was Glenullin’s to lose after a long and successful tenure in the senior ranks and Claudy’s to win after being absent from the top table since 1994! There had been nothing between the sides throughout the game in this battle of the Mitchel’s, although Claudy had been somewhat out of sorts in the early stages as Martin Donaghy scored their solitary point of the opening 20 minutes in the 15th minute in response to points a Paddy Bradley (free) and a second from Eoin Bradley. When Paddy Bradley made a tremendous catch near the Claudy goalmouth in the 20th minute and then dispatched the ball to the net for 1-02 to 0-01 it looked as if the impasse might have been broken but, as they have done all season Claudy reacted superbly to adversity and the indefatigable Callum McElhinney did exactly what Paddy Bradley had done earlier with a clinically taken goal. Shane McGahon levelled at 1-02 each but Paddy Bradley restored the Glenullin lead with a well taken point, Aaron Kerrigan levelling once again in the 28th minute. Bradley responded from another free but Claudy finished the half with points from Shea Kerrigan and Paddy Hargan to take a slender 1-05 to 1-04 lead to the break. Martin Donaghy opened up a two point gap early in the second half, Dermot O’Kane squeezing the ball just inside the post from a narrow angle on the left but crucially Claudy came back strongly with a brace of points from Hargan and Aaron Kerrigan to open up a three point gap in the 36th minute. For the next 10 minutes nerves seemed to get the better of both sides, Paddy Bradley, from a free, and Eoin Bradley from play, off target either side of an Aaron Kerrigan wide. That win was for Conall. Dermot O’Kane, Paddy Bradley and Aaron Kerrigan then found their scoring touch from frees for 1-09 to 1-07 with nine minutes remaining. Claudy tried to defend their two point lead by dropping players back but Paddy Bradley pointed a free in the 54th minute, Christopher Dempsey levelling the score at 1-09 each from a Gerard O’Kane pass in the 58th minute. Paddy and Eoin Bradley missed difficult scoring chances and the game ended all square! In the opening minute of extra time Paddy Bradley wided a 20m free in front of the posts, Paddy Hargan edging Claudy ahead. Midway through the first period Gerard O’Kane and Eoin Bradley set up substitute Ruairi Boylan for a goal, Glenullin 2-09 to 1-10 ahead at the break. Callum McElhinney pulled back a point on the restart, Donaghy levelling from a free at the midpoint of the half. However the ‘fat lady’ seemed to be getting ready to sing her final aria when Paddy Bradley pointed two frees for 2-11 to 1-12, his second in the final minute of play. But Claudy refused to give up and swept forward on the kick out and James McClay’s pinpoint pass, allied to a defensive slip, set up Aaron Kerrigan for the winning goal, the stunned Glenullin players sinking to the ground in disbelief at the final whistle, the jubilant Claudy players mobbed by delirious Claudy spectators. The ‘fat lady’ was singing her final aria with operatic fervour. “I never could see that finish coming, even though I never gave up on the game,” said a delighted Marty Donaghy after the game, “Glenullin got a free to go two points up and I thought it would be hard to get back up the pitch to the other end, never mind get a score out of it. “But there was one minute to go when that point went over and I was thinking that this could be my last game as we were two points behind. Donaghy agreed Claudy had got off to a sluggish start, with Glenullin dominant in the middle third. When asked what it meant to Claudy after 21 years playing in the Intermediate ranks, Donaghy had one clear message. 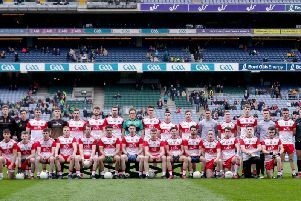 “That win was for Conall,” he replied referring to his late club mate, Conall Kerrigan, who lost tragically passed away back in August. Claudy scorers: Aaron Kerrigan 1-03 (2f), Paddy Hargan 0-03, Callum McElhinney 1-01, Martin Donaghy 0-03, Shane McGahon and Shea Kerrigan 0-01 each. Glenullin scorers: Paddy Bradley 1-08 (4f), Ruairi Boylan 1-00, Dermot O’Kane 0-02 (1f), Eoin Bradley and Christopher Dempsey 0-01 each. Referee: John Joe Cleary (Castledawson).